Made by Colnago, Ernesto in Italy, Europe, 1989-1995. The Colnago C35 is one of the first road bikes made with a carbon fibre frame. The C35 was launched in 1989 to celebrate the 35th anniversary of the company founded in 1954 by Ernesto Colnago at Cambiago near Milan. 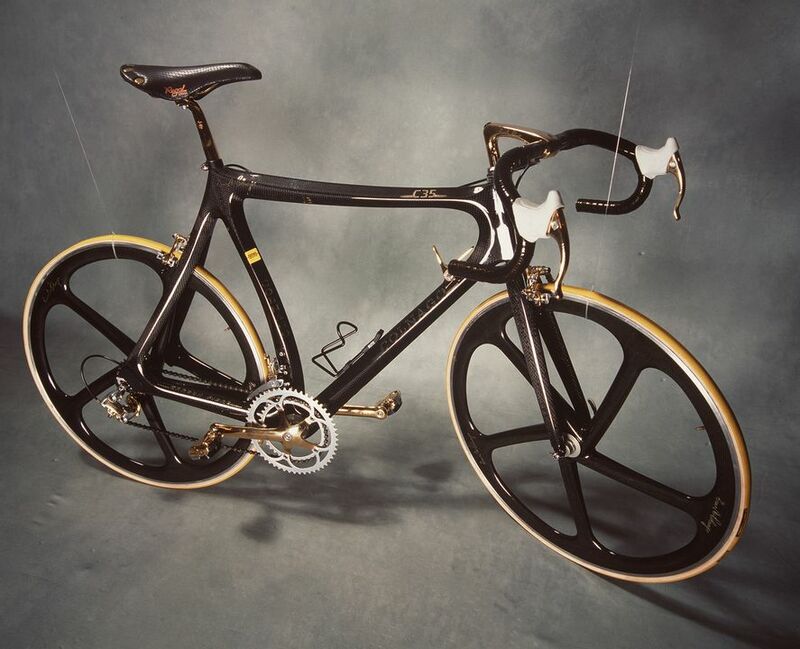 Bicycle, Colnago C35, carbon fibre/metal/rubber, Colnago, Italy, 1989. The frame and wheels of the bicycle are black carbon fibre. The metal fittings are polished; chrome and gold plated. The wheels have five radial, carbon fibre spokes and the tyres are yellow rubber. They are protected by red fabric gaiters. The handlebars are bound with black 'tape' and the saddle is black leather. The water bottle bracket is fitted although the bottle is not in evidence. Front and rear brakes are fitted. Gears are also fitted. The upper frame tube is 'autographed' in gold with Ernesto Colnago's signature. This signature also appears on the wheels in gold. towards the steering head is "C35" in gold. On the down tube from the seat to the pedals is "Colnago" and on both sides of the tube is a small yellow sticker with "Ferrari Engineering" written in black. On the tube from the steering head to the pedals is "Colnago" in gold. The words "carbon fiber" appear on the tube from the pedals to the rear sprocket. marked in gold on upper frame "Ernesto Colnago"
marked in gold on steering head "35"
Designed at Ernesto Colnago's company in association with Ferrari Engineering. Ernesto Colnago (b.1932) became a racing cyclist during his teens until a broken leg suffered in 1952 aborted a promising career. Working first as a mechanic, Colnago began making custom racing frames in 1954, and quickly attracted the patronage of some of Italy's leading riders. Colnago was among the first to realise that a short wheelbase frame with a comparatively upright seat tube would be more responsive than existing frames. In 1957 Gastone Nencini won the Giro d'Italia using a Colnago frame. This was the first of numerous successes achieved with leading cyclists, most notably Eddy Merckx. Colnago has sponsored and supplied numerous leading teams, most recently the Dutch team Rabobank, whose Denis Menchov took third place in the 2010 Tour de France. It is often claimed that more professional races have been won on Colnago bikes than those of any other manufacturer. As well as frame and fork design, Colnago has also played a leading role in the development of frame materials including aluminium, titanium and the first carbon fibre frames produced during the 1980s. Despite this, Colnago continues to produce a range of steel alloy frames. Colnago is still based at the village of Cambiago where Ernesto Colnago was born. However much of its frame production has since 2005 been out sourced to a Taiwan manufacturing consortium lead by Giant. This bicycle was placed in a charity auction to benefit the Australian Opera by Clarence Street Cyclery. It was purchased by the donor for $11,000 with the intention of using it as a road bike. The donor considered the bicycle 'too good' to be used on the road and donated it to the museum in unused condition. He advised that he had not removed the bicycle from its box.